How would a change in monetary policy, such as a cut in the policy interest rate, influence the economy? To answer this question, one first needs to isolate the policy changes that are not systematic responses to changes in the economic outlook, and therefore are not contaminated by the impact of underlying economic developments. These changes are commonly referred to as monetary policy shocks. To obtain a proxy for such shocks, a growing body of literature uses changes in market-based interest rate expectations (interest rate surprises) over a short time interval around regular central bank announcements (e.g. Kuttner 2001, Gürkaynak et al. 2005, Gertler and Karadi 2015). This approach has two advantages. First, the surprises are purged of the impact of the systematic policy response to the expected outlook, because financial markets already incorporate these into their interest-rate expectations prior to the announcements. Second, the short interval guarantees that disturbances independent of the announcement do not systematically contaminate the proxy. In a recent working paper (Jarociński and Karadi 2018), we argue that this approach needs to be refined, because central bank announcements can convey information not just about monetary policy but also about the central bank’s own assessment of the outlook. The central bank’s outlook may differ from that of the public, and the communication can therefore drive private expectations independently of the monetary policy shock, contaminating interest rate surprises. In other words, there are ‘pure’ monetary policy shocks and there are central bank ‘information’ shocks about the economic outlook. 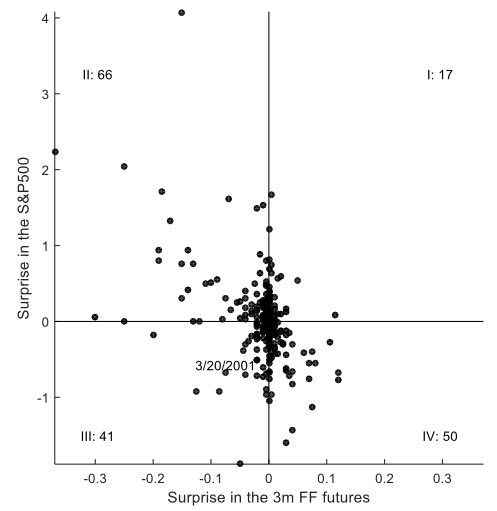 We propose to disentangle the two by using stock market surprises together with interest rate surprises. The idea is simple. If interest rate surprises around policy announcements only reflected monetary policy shocks, they would co-move negatively with stock price surprises – that is, stock prices would unambiguously increase after a negative interest rate surprise. The reason is that a policy easing raises the present value of future dividends, because it both lowers discount rates and increases future dividends by engineering an upswing. However, we find that the co-movement is not always negative in practice. We argue that a positive co-movement of interest rate surprises and stock prices signals the presence of an information shock in the announcement. Notes: The ‘surprises’ are calculated as the change in the respective instrument in a window starting 10 minutes before the press release and ending 20 minutes after the press release. Source: The updated dataset of Gürkaynak et al. (2005). Figure 1 shows that it is not unusual to see stock prices fall while interest rate expectations (measured here as the changes in the three-month-ahead federal funds futures rate) also decline, as in the example given above. In the sample of all policy announcements between 1990 and 2016, there are 58 data points in quadrants I and III, where stock prices co-move positively with a surprise change in interest rate expectations – either both increase or both decrease. There are 116 data points in quadrants II and IV and the rest are on the border. The fact that stock prices do not move in the opposite direction to interest rates in one third of the (interior) cases suggests that a policy announcement conveysnot only news about interest rates, but also news about the state of and prospects for the economy itself. 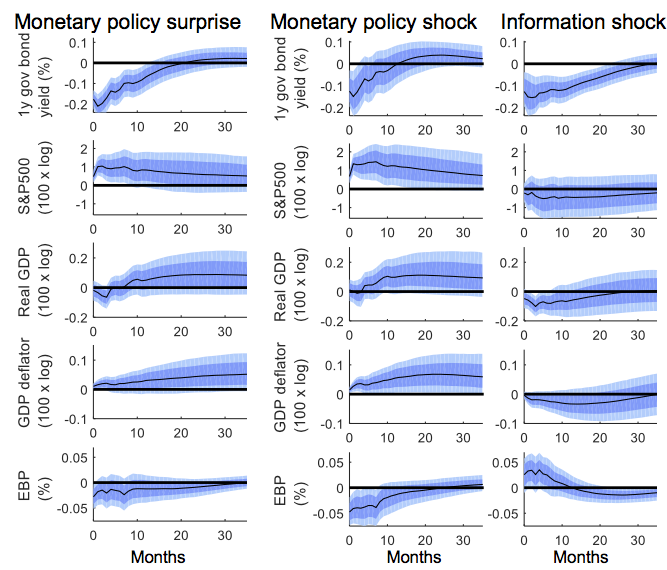 To investigate this further, we estimate the impact of monetary policy surprises on the main financial market and macroeconomic variables – but first without controlling for the presence of central bank information shocks. To achieve this, we use interest rate surprises during all events depicted in Figure 1, irrespective of the direction of the accompanying stock market reactions. We insert these proxies into a standard Bayesian vector autoregression (VAR) on monthly US data between 1979 and 2016. The first column of Figure 2 shows the results. The solid lines depict the point estimates and the shaded areas show 68% and 90% confidence bands. The shock causes a temporary decline in the one-year Treasury bond yield. This decline stimulates real activity (measured by real GDP) after a puzzling negative short-term impact, and raises prices extremely gradually (measured by the GDP deflator). This coincides with an appreciation in the stock market (S&P500) and a decline in a popular measure of financial conditions in the corporate bond market (the excess bond premium, see Gilchrist and Zakrajsek 2012). Note: Median (black line), 68% range (dark blue) and 90% range (light blue). To refine the estimates, we now disentangle monetary policy shocks from central bank information shocks.To achieve this, we treat the data points in quadrants II and IV of Figure 1 as proxies for monetary policy shocks. At these data points, interest rate expectations and stock prices move in the opposite directions, as expected after a surprise change in monetary policy. In contrast, we treat the data points in quadrants I and III of Figure 1 as proxies for central bank information shocks. These events also originated from a central bank announcement, but the positive co-movement of interest rates and stock prices suggests that they are the joint result of the central bank communicating about the economic outlook and, in parallel, adjusting interest rates in response to it. The second and third columns of Figure 2 show the results. It is immediately apparent that the two shocks have very different impacts on the economy. A monetary policy shock (second column) causes a flexible increase in the price level and an improvement in economic activity, now without the puzzling short-term negative impact. The point estimates show an increase in stock prices and a sizable decline in credit spreads. In contrast, a central bank information shock that reduces interest rates is accompanied by a decline in activity and in the price level, a depreciating stock market, and worsening corporate credit conditions. This is consistent with bad news about the economic outlook that is accompanied by an offsetting systematic policy easing. The estimates of the effects of a monetary policy easing using the standard and the refined methodologies are qualitatively similar. Except for the puzzling temporary drop in activity in the standard estimation, both predict a temporary upswing, an increase in prices and improving financial conditions. How important is it then to refine the standard methodology? To assess this question, we use a structural model (Gertler and Karadi 2013), in which monetary policy influences economic activity through two main channels. The first is a channel caused by ‘nominal frictions’, which are standard in New Keynesian models (Galí 2015). Prices only adjust gradually, so, as monetary policy easing raises aggregate demand, it improves economic activity. The second channel is caused by ‘financial frictions,’ and is usually referred to as the credit channel of monetary policy (Bernanke and Gertler 1995). In our framework, financial intermediation is imperfect. A monetary policy easing raises asset prices and improves the balance sheet of financial intermediaries, which respond to this by easing credit conditions. Easier credit, in turn, stimulates economic activity and amplifies the effect of the underlying policy shock. We bring this model to our standard and refined estimates presented on Figure 2 and use it to assess the relative importance of nominal versus financial frictions in the two cases. We find that, contrary to the standard estimates, our refined estimates assign a sizable role to the credit channel – they explain around half of the impact of monetary shocks on economic activity. The standard model underestimates the importance of the credit channel, because the estimated response of prices there is unrealistically gradual. With such extreme price inflexibility, the model needs no financial frictions to explain the estimated impact of the policy shock on economic activity. Our conclusions are two-fold. First, central bank announcements convey new information not just about policy, but also about the state of the economy. Second, controlling for information shocks is important for the precise measurement of the transmission of monetary policy shocks. We find that results are broadly consistent with standard New Keynesian theory about monetary transmission. We find, however, that frictions in credit markets, as reflected by the response of corporate bond spreads, play a more important role, and frictions in price-setting and wage-setting, as reflected by the price-level response, play a less important role in explaining the impact of monetary policy on economic activity than suggested by previous research. Bernanke, B S and M Gertler (1995), “Inside the black box: The credit channel of monetary policy transmission”, Journal of Economic Perspectives 9(4): 27-48. Galí, J (2015), Monetary policy, inflation, and the business cycle: An introduction to the New Keynesian framework and its applications, Princeton: Princeton University Press. Gertler, M and P Karadi, (2013) “QE 1 vs. 2 vs. 3...: A framework for analyzing large-scale asset purchases as a monetary policy tool”, International Journal of Central Banking 9(1): 5-53. Gertler, M and P Karadi (2015), “Monetary policy surprises, credit costs, and economic activity”, American Economic Journal: Macroeconomics 7(1): 44-76. Gilchrist, S and E Zakrajsek (2012), “Credit spreads and business cycle fluctuations”, American Economic Review 102(4): 1692-1720. Gürkaynak, R, B Sack and E Swanson (2005), “Do actions speak louder than words? The response of asset prices to monetary policy actions and statements”, International Journal of Central Banking 1(1): 55-93. Jarociński, M and P Karadi (2018), “Deconstructing monetary policy surprises: The role of information shocks”, CEPR discussion paper 12765.